I woke up yesterday morning to find the worst possible scenario (except perhaps for a zombie apocalypse). The internet had failed! I tried rebooting my modem and even went as far as resetting it but not only was it not connecting to the internet, I couldn’t even connect to it. So I arranged to have a replacement modem shipped to me here for today and it arrived just before lunch. I plumbed it all in and everything is now back to normal. Even after fitting the ferrite filters I picked up at the Kempton Park rally, the old modem still wasn’t very good. Although it no longer dropped the connection when I transmitted on 20m, the performance decreased and it was just unreliable. 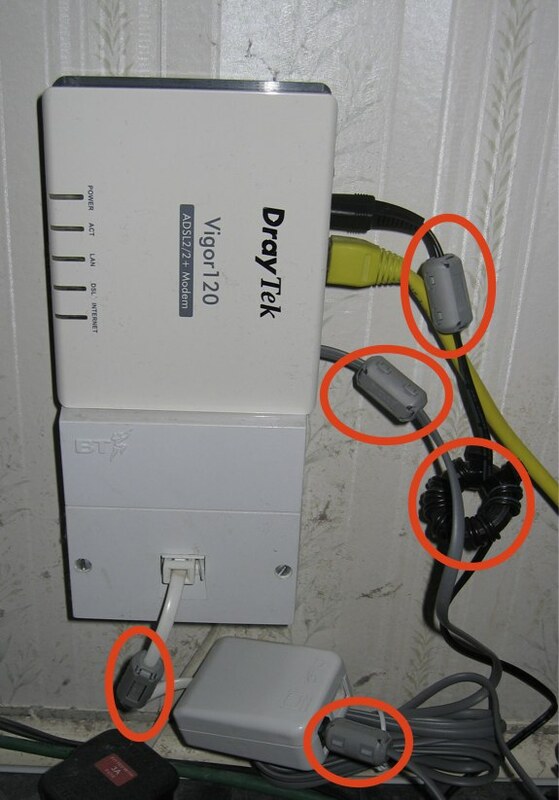 This DrayTek Vigor 120 ADSL2/2+ Modem already seems better. For a start, it actually works and it doesn’t seem to suffer when I transmit. I transferred the ferrite filters from the old modem straight to this one so that I was protected from the start. For what is effectively a geek family, it was a real struggle for us all to be without the internet for even just a day. Simple things like picking up the iPad to look at IMDB after watching a film, or looking to see who that familiar person was on the telly weren’t possible. I had some JT65 QSOs and I normally have a look at qrz.com to get a name for the logbook as exchanging names via JT65 isn’t normally done. I had an eBay auction due to end so I had to use my iPhone to get the address of the buyer. I do have a data plan on my iPhone but that only includes 1Gb of tethered/hotspot data and with four people using it, that data would have vanished very quickly. As it happens, I’ve already decided to increase that data plan to unlimited for just an extra fiver a month so I’m going to make sure I do that when I’m back at work next week. I was expecting delivery of an 80m QRSS transmitter kit from QRP Labs yesterday but unfortunately that only arrived this afternoon. What ever happened to the ‘morning’ post? Our postie arrived at 14:30 today and by 15:30 I’d already got this far with the kit. All that’s left is to wind the coils and get it mounted into a box with a 7805 and a couple of 0.1uF decoupling caps and set it up. The coil wire which came with my previous kits had a red coating which came off with heat but this copper coloured coating doesn’t seem to and I’m going to have to scrape the ends which I’m really not keen on doing as I tend to be too enthusiastic and end up breaking the wire. Has anyone got any spare coil wire that can be stripped by heat that they could send me? If so, please email me through the link on this page. Once it’s built I’ll have the full set of QRP Labs QRSS transmitters, 30m, 40m and 80m so will be able to choose which one goes on air and when. I’m still finding the low power propagation stuff to be absolutely fascinating and loving the fact that a simple low power home built kit can produce a signal that’ll go worldwide. Don’t worry though, this doesn’t mean I’ve become a QRP enthusiast (although I did join the G-QRP club earlier this year), it just means I like playing with my soldering iron and knocking up kits. Besides, I can’t be a QRP nut, I don’t have any Altoids tins! 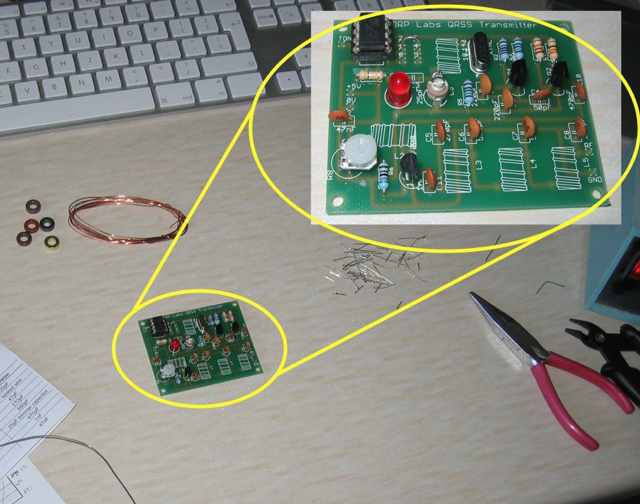 This entry was posted in Amateur radio, Construction, CW, QRSS, QSO365 and tagged QRSS, QSO365. Bookmark the permalink. The red wire is known as “self-fluxing” – it’s handy stuff! I’ve just ordered a reel of self-fluxing polyurethane enamel wire in 27SWG from http://www.greenweld.co.uk so hopefully it’ll be here nice and quickly.